Kane Williamson and BJ Watling shared a world record sixth-wicket partnership of 365 as New Zealand dominated Sri Lanka on day four of the second Test. Captain Brendon McCullum declared on 524-5, leaving Sri Lanka needing 390 in 107 overs at Wellington’s Basin Reserve to win and square the two-match series. Williamson hit an unbeaten 242, his first Test double century while Watling made 142 not out, his fourth Test ton. The record tops the 352 Watling and McCullum made against India last year. That feat was also achieved at the Basin Reserve, where a bronze plaque marking the achievement had only been set in concrete three days ago. 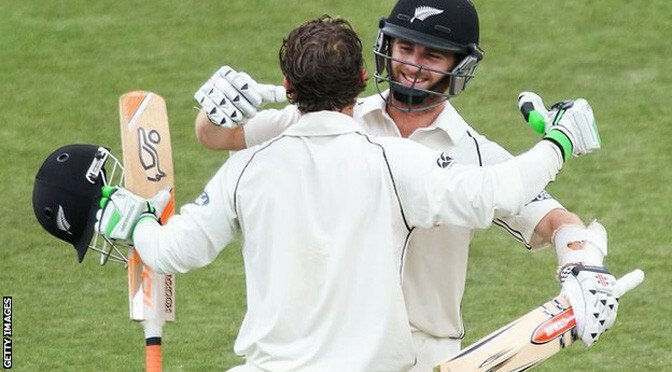 Williamson spent more than 10 hours at the crease, scoring his ninth Test century and the seventh highest score by a New Zealander. The 24-year-old faced 438 deliveries, scoring 18 fours, while Watling posted a career-best 142, with nine fours and a six as Sri Lanka toiled. The tourists had reached 45-1 by the close after Dimuth Karunaratne fell for 17, leaving his opening partner Kaushal Silva (20 not out) and nightwatchman Dhammika Prasad to see them through the final overs.